The average persons core body temperature is 98.6 F (37 C). Human skin is a few degrees colder, being about 35 C (95 F). Heat travels from hot regions to cold regions, according to the Second Law of Thermodynamics. Thus when the wet-bulb temperature, which is the temperature at 100% humidity, reaches 35 C (95 C) the human body can no longer shed heat (sweat no longer evaporates), thus core body temperature rises, and the healthiest person, (editor: ‘even’) sitting in the shade, dies in about 6 hours. The rest of us (young, old, medicated, out-of shape, obese, etc…) are SOL at even lower wet-bulb temperatures. Adaptation would require living inside with AC, living in caves, or wearing cooled suits; who wants to do that?? At 35 degrees Celsius (95 F) and 100% humidity (at 100% humidity this temperature is called the wet-bulb temperature) the human body is unable to cool itself by sweating, since the sweat will not evaporate from the skin. As a result, the body core temperature rises, heat exhaustion and then heatstroke sets in. A physically healthy person sitting in the shade, in a well ventilated area, is dead in 6 hours. Higher temperatures, and correspondingly lower humidity do the same thing. The very young, old, people on medication, etc. succumb to less extreme temperatures and humidity. This video expands upon my last video, which explains how many regions around the planet are reaching these uninhabitable conditions. Thank you to Gary Null and Kevin Hester. 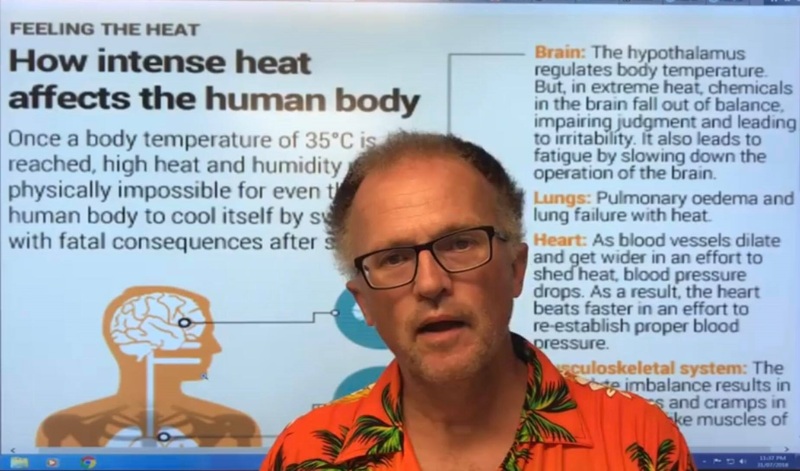 Thanks also to super blogger, Robin Westenra for sharing this at See More Rocks blog: ‘Paul Beckwith, Gary Null and Kevin Hester analyse the rapidly unfolding Climate Catastrophe‘. How hot can it actually get? What is in store for us? When you combine the heat domes sitting over many countries with high humidity, many areas around the planet will soon reach the deadly 35 C (95 F) 100% humidity (wet bulb temperature) or equivalent situation whereby a perfectly healthy person outside, in a well ventilated area, in the shade will die from the heat in 6 hours. Most people, like the very young, the elderly, and the rest of us won’t last anywhere as long, at even lower temperatures. 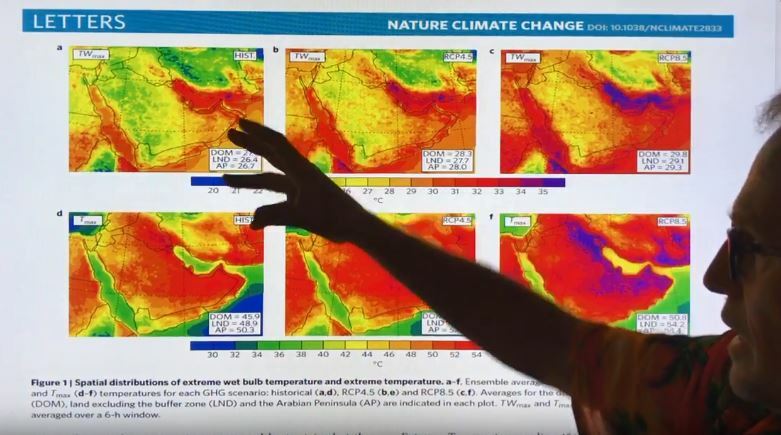 I discuss the latest peer-reviewed science on how parts of high-risk regions in the North China Plains, Middle East, and South Asia will soon be rendered uninhabitable by combined heat and humidity. The majority of land masses are in the northern hemisphere, along with the majority of human populations. However, we can never forget the Southern Hemisphere, and the enormous mass of ice that sits on Antarctica. With Arctic Temperature Amplification, mostly from an increase in absorbed sunlight due to darkening from snow and ice decline, more heat travels from the equator to the Southern Hemisphere, with important consequences to air and water circulation around Antarctica. It is vital to understand how an Arctic Blue Ocean situation will impact glacier mass in Antarctica, and thus sea-level rise. Extreme weather events around the entire globe are notching up in frequency, severity, and duration, as well as changing location, and many people are surprised that this is also happening in the Southern Hemisphere. This summer's extreme weather events are simply a prelude to a rising tide of #climatechaos. How long before people demand radical action from governments? This entry was posted in Catastrophe, Climate, Climate Change, Global Warming, New Video, Rapid Climate Change, Science, Uncategorized, Videos, Warnings, Weather and tagged Aerosols, Air Conditioning, AIRS, Altitude, AMAP, AMOC, Arctic, Arctic Amplification, Arctic Sea Ice, Atmospheric Rivers, CAPE, Carbon Dioxide, CDR, CH4, Clathrates, Climate, Climate Casino, Climate Change, Climate Mayhem, Cloud Condensation Nuclei, Clouds, CO2, Coastlines, Contrails, Convection, Convective Available Potential Energy, Convective Uplift, Ebullition, Erosion, Feedbacks, Ferrel Cell, Fractured, Gary Null, Geoengineering, Geography, Geology, Geomorphology, GHG, Global Warming, GRACE, Grand Solar Minimum, Greenland, groundwater, GSM, GWP, Hadley Cell, Heat Dome, Heat Stroke, Heatwave, Heatwaves, Humidity, Hydration, Hydrological Cycle, Hydrology, Hydroxyl, Hyperthermia, ice, Jet Streaks, Jet Streams, Kevin Hester, Latent Heat, Lifetime, Methane Burbs, Methane Gun, Mortality, N2O, Nebraska, Negative Vorticity, North Dakota, O3, Ocean Currents, Ozone, Paul Beckwith, Permafrost, Polar Cell, Polar Vortex, Positive Vorticity, Precipitation, Pressure, Radiative Forcing, rain, rainfall, Robin Westenra, Rotation, Salinity, Satellite, Satellites, Sauna, Sensible Heat, Siberia, Siberian, Siberian Atmospheric Rivers, snow, Solar, Solar Cycle, SoundCloud, South Dakota, SRM, SSW, Storm Chasing, Storms, Stratosphere, Streaks, Sudden Stratospheric Warming, Sun, Sunspots, Superstorms, Taiga, Temperature, THC, Thermohaline circulation, Thermometers, Tornado, Tornados, Trigger, Tropopause, Troposphere, Tundra, Vorticity, Water, Water Cycle, Water Vapour, Weather, Weather Extremes, Weather Weirding, Weather Whiplashing, Weather Wilding. Bookmark the permalink. I’d read that pretty much nowhere on the planet gets above about 31C wet bulb temperature, currently, due to some feedbacks which limit that temperature but that, towards the end of the century, the limit will likely move up in some places.